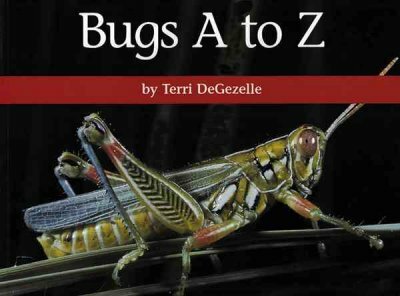 I wanted to include a non-fiction book for our “Bugs” storytime, and using a portion of Bugs A to Z worked pretty well. This book has a full color photograph of a bug for each letter of the alphabet, plus a couple paragraphs of basic facts. 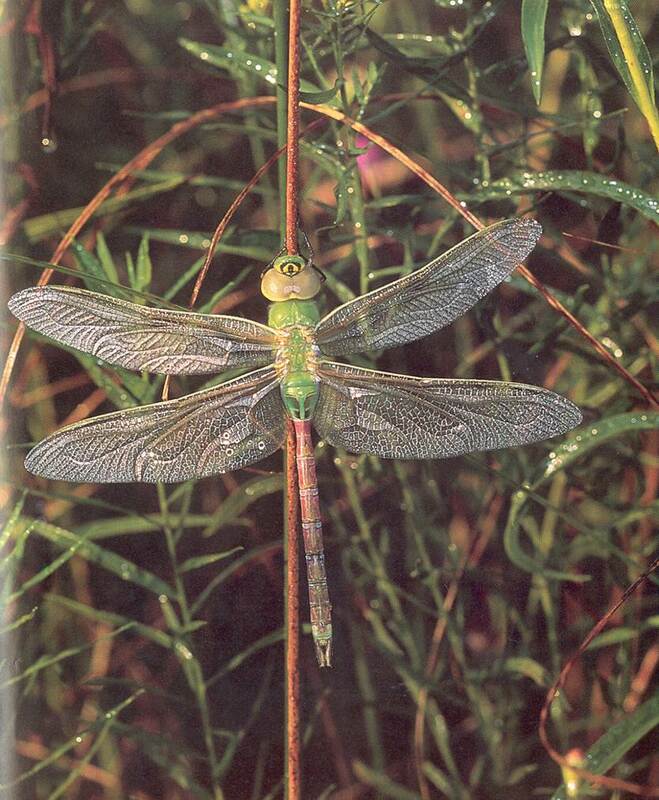 For storytime, I scanned six of the more familiar bugs: Ants/Aphids; Dragonflies; Honeybee; Fireflies; Ladybugs; and Grasshopppers. I first showed the letter (“G is for….”) and asked the kids to guess. This worked best when I gave them really good clues: “It’s green and it hops…” (and if the child I call on doesn’t get it: “It hops on the grass…and it starts with ‘grass…’”). Then the photo is on the screen, and these are large enough and clear enough to be pretty impressive visually. I share a fact or two from the text, but not everything with this age group. Reading this book one on one I would read it all, but for a group it needed to be simple and graspable. 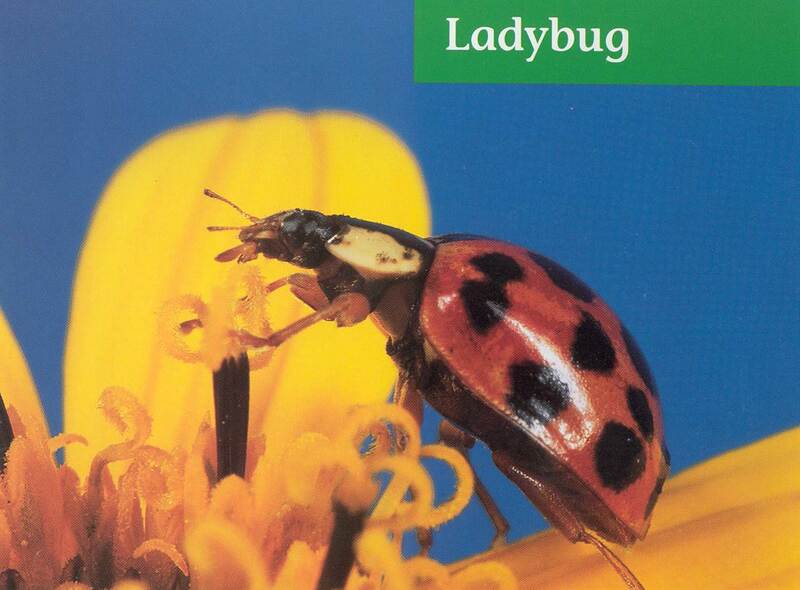 So for ladybugs: “If they are in danger, they can pull their head under their shell...” and that's enough. Our little laser pointer came in handy for showing the ladybug’s head, the grasshopper’s wings and feet where they rub them together, etc. This all would have worked fine, but to make it even more engaging I added a short Youtube video for three of the six insects. The photo (above) shows the dragonfly’s two sets of wings very nicely. But when you can then show a slow motion video (below) that clearly shows how the wings don’t move in unison, it really comes through well. For the fireflies, the film showed a night sky with fireflies flickering in the distance and the kids had fun spotting them before they quickly disappeared. We ended with the “song” of the grasshopper. In the video you can just see the legs moving against the wings. Normally I feel a bit hesitant to add a video feature, since it seems like it might lead kids away from library books for learning. But the truth is kids can and do learn a lot from both, and I felt like the film clips supported the words and photos without detracting from them. 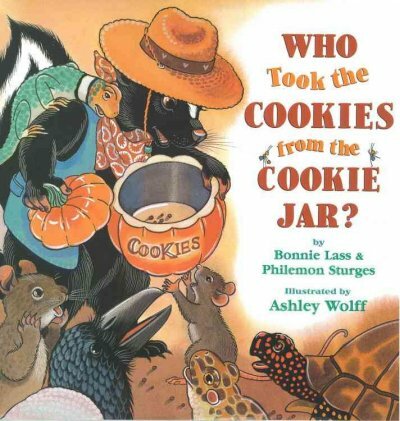 We had a bunch of other non-fiction insect books for preschool age kids (or close) on our book display table, and letting the audience know about these as the conclusion for this book led to a lot of checkouts. This classic picture book is one of my favorites to tell with puppets. 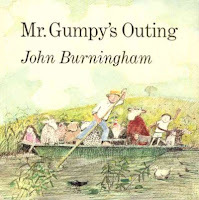 The story and puppetry are both simple: Mr. Gumpy is about to take a boat ride on the river when a child comes along ans asks to join him (it's two kids in the book, but one works better with puppets). "Yes," says Mr. G., "but you mustn't squabble." It’s a simple, natural telling with puppets. Each hopeful passenger pops out of the puppet bag, interacts with Mr. Gumpy, and gets into the boat. The boat can be a flat box lid or tub lid. Even better is a flat surface with short sides, like a soda can case box or a wide, shallow plastic lid, so you can prop some of the passengers over the edge. Even so, some of the animals don’t really stand up that well once they’re in the boat, but that’s okay, I just pile them in. At that point the audience is focused on the next animal, and just need to see that the boat is getting more and more full. When the boat tips over, of course, you just dump all of the puppets onto the floor. A fun moment, especially with toddlers because they don’t quite expect you to do that with puppets. After the spill, they swim to the shore, dry off, and join Mr. Gumpy for tea. A very comforting conclusion: yes, everyone did what they weren’t supposed to do and caused a disaster, but they all just decide to make it part of a fine day anyway. I actually think everyone in the boat knew this would happen all along and were even looking forward to it, including Mr. Gumpy. The dialogue between Mr. Gumpy and the animals if fun, as the not always familiar language (“mustn’t squabble”…”don’t trample”…”don’t muck about”) catches the ear and the attention. I used this presentation with toddlers a couple weeks ago, but the story also works well on a larger scale. 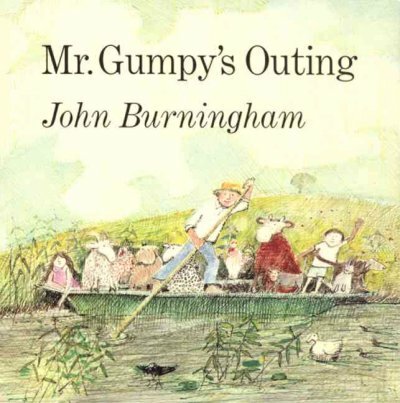 For our Family Storytime, we’ve acted it out with one narrator, one Mr. Gumpy (with hat and long pole), a cut-out boat that leans against chairs, and kids joining the boat as the passengers (with puppets or other props). 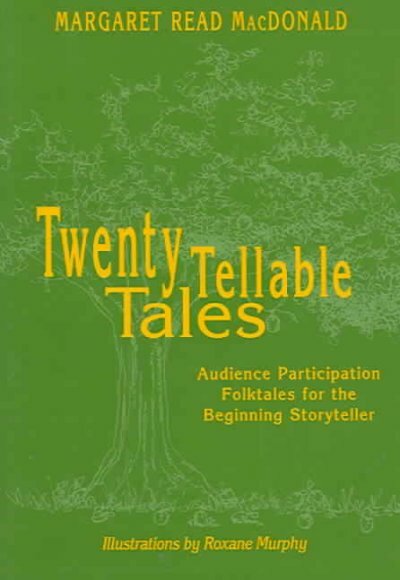 In fact, we like the story so much, Terri and I even performed it for adults at a recent Library Foundation dinner, to give supporters a sample of what library programs are like…. Brad and I told this story for our “Bug”-themed Family Storytime. Bugs really only show up at the end, but that’s close enough. My first thought was to have one of us out in front, looking for the missing cookies with the other behind the puppet stage, popping out animals one by one. But we didn’t have a good idea for the ending, where it’s revealed that ants are the culprits. Then Brad came up with the excellent idea of projecting the ants on the screen. And if we’re showing the ants at the end, why not also use the screen to show the cookies. He copied images of ants and cookies, set up some Motion Paths with PowerPoint, and here’s how it worked. 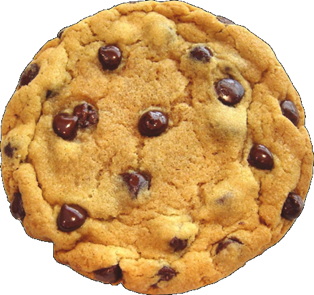 Mouse exits, and another cookie marches across the screen, this time towards the panel on the other side of the screen. And there’s just enough room behind the projection screen for me to move behind it, unseen by the kids, to the panel on the other side. Brad follows the cookie, accuses the animal that pops out on that side (Bird: “I share your concern, but I only eat…worms!” and the pattern continues. We did this four times, so all the kids soon spotted the traveling cookies. Finally Brad starts the song for the last time and the next click shows cookies marching again, but this time you also see the Ants carrying them. Brad’s idea of using the screen as a sort of extension of the puppet stage was great. We’ve already used it again for a different story (Don’t Let the Pigeon Drive the Bus, which will have an entry here soon). It allowed us to move from one side of the room to the other, with the cookies changing directions each time. Without using the screen this way, though, it would have been fine to have all of the puppets appear in the same spot. We just would have had the cookies march across in the same direction each time, instead of alternating. 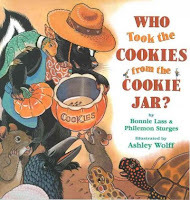 The flow of this story was nice because it incorporated several types of interaction, but in ways that the kids could easily follow and play along with: singing along with the song; spotting the moving cookies; and focusing on the puppets’ interactions with Brad. Since we did this story four times in three days (all of our Family Storytimes run this way), I had some fun substituting different puppets: a Frog (“you must realize, I only eat…flies!”); two Dogs (“we don’t care for your tone! We only eat…bones”); a Bear (“You might think it’s funny, but only eat….bunnies!...Oops, I mean I only eat…honey!”). So really any puppets will do. 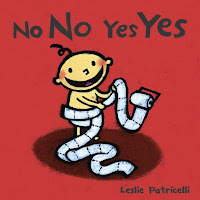 Leslie Patricelli’s board books are among my favorites for one and two year olds. Besides being very funny, the illustrations are bold and bright enough to work in a storytime setting if the group isn’t too large. In No, No, Yes, Yes, a baby does something wrong on the first page (pulls a cat’s tail), then does it right on the opposite page (pets the cat). The only text is “no no” for one page and “yes yes” for the other. I like to read the book, with kids and parents joining in on the no’s and yeses, then pull out my own baby puppet and have him follow up with the same pattern. I use some of the actions from the book. Baby pulls out a squeaky hammer and hammers me on the head (“no, no!”), then softly hammers the table (“yes, yes!”). Out pops a cat puppet for tail pulling and then petting. The pattern of the book is so strong, you can really see the kids anticipating what the puppet will do based on the book they just saw. I’m not sure if they’re specifically remembering (“he pulled the cat’s tail in the book, now he’s going to pull the puppet cat’s tail, then he’ll pet the cat, like he did in the book”) or if they’re more applying the pattern they’ve absorbed (“he’s going to do something he shouldn’t do to that cat, then he’s going to do something that’s ok”). Either way it’s excellent practice at narrative skills. Then I bring in a few new items that weren’t in the book to extend the pattern. A baby bottle (hold it upside down and shake it….then drink); or a cracker (crumble one cracker up…then get a second cracker and politely nibble). I like to finish with a pillow and do a few “no no’s”: Toss it in the air; Bop me on the head with it; Bounce up and down on it. Then finally end it with a satisfying “yes yes” of lying down and going to sleep. If you don’t have a baby puppet, an animal can work just as well as the one that gets stuff wrong, then right. It’s all pretty simple, but the combination of narrative skills development and playing around with behaviors that are just at the audience’s level, make it an especially appealing toddler time choice. 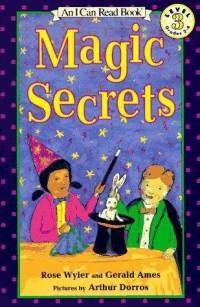 Our October “K-2 Book Adventure” was on “Magical Tales & Tricks.” We don’t have a real strict structure for this program, and it this case the theme lent itself to a slightly different approach: We alternated stories with magical elements with actual magic tricks. 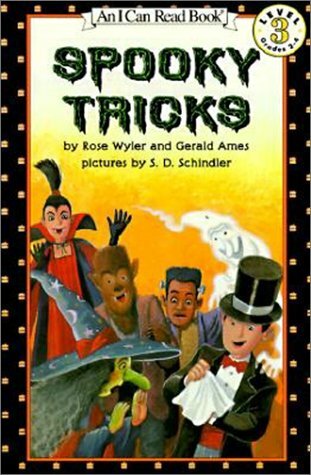 We highlighted two of Rose Wyler’s early reader magic trick books…still the best for simple tricks that kids can really do. We weren’t trying to impress the kids with our magician skills (since we have none); we wanted them to understand the trick and get excited about trying it on their own. To start off we handed out a tube of paper to every child and had them try “The Magnificent Magical Hand Trick” (we did make up our own names for the tricks to get some alliteration going). That’s where you hold your hand next to the tube, look through it, and it looks like it has a hole in it. I think about 75% of the kids got it. Which did make this maybe not the best choice for an opening trick, but we wanted one that everyone could do. Then we acted out The Little Rooster and the Diamond Button. Details are on this page. Next trick was “The Sensational Strange String Trick.” Put two strings into your mouth…pull out one string! This one takes a bit of practice, but works very well. As I mentioned, we don’t have sleight of hand skills, but did have a lot of fun with the patter, going on a bit about how we thought about using tape or glue to connect the strings, but instead….we’ll do it with our mouth! 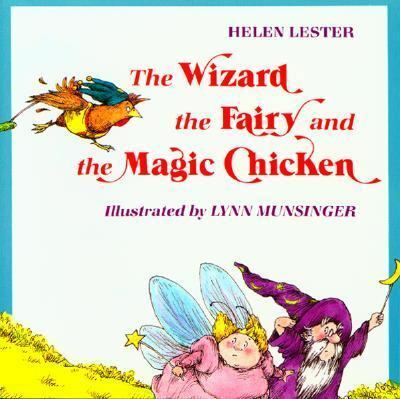 The Wizard, the Fairy and the Magic Chicken was our next magical tale. Details are here. “The Stupendous Sticky Hand Trick” is where you pick up a ruler with your flat palm and no fingers. Obvious once you see the trick, but it does fool most kids the first time. 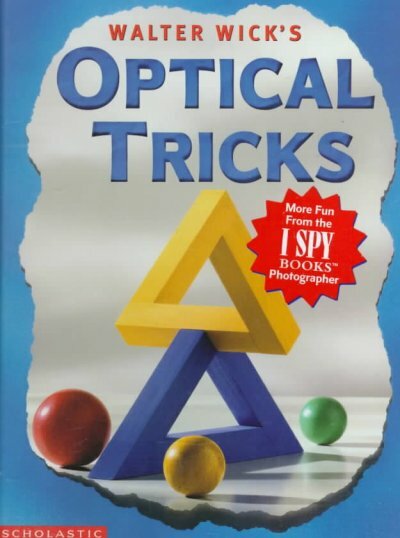 For a change of pace we used a “kind of” magic book: Walter Wick’s Optical Tricks, one of my favorites. We scanned three of the images from the book, challenging the kids to explain how the photograph we’re looking at is possible. Then we projected the solution from the book. For the third one, we only showed the illusion (the one with the red cube) and told them to check out the book if they can’t figure it out. This book is a stretch for most kindergartners, but I think the first and especially second graders can get it (though I’ve also used with 4th and 5th graders, which might be even better). Our final magic trick was “The Extraordinary X-Ray Eyes Trick.” This is the one where a few kids tell you their names, you write down each of them on a card, then “see through” the card that’s selected to reveal the name. The trick: once you write down the first kid’s name, you just write it again four more times, whatever the other names are. Another one the kids could go home and try that night on their family I bet. 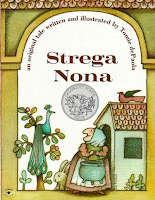 We finished with Strega Nona by Tomie dePaola. We stripped down the story to the core. Strega hires Big Anthony; Big Anthony sees her make pasta with her magic pot; Anthony tells people about it but nobody believes him; Anthony makes pasta, but can’t stop it. It’s an excellent story even though many of the kids may have known it already. And for the overflowing pasta, we got to use Silly String, which is always a plus for this program. Since it overflowed all over Big Anthony and all over the village (the audience) there was plenty of mess to clean up, which is why we saved this one for last. With three people, we could add some fun physical pieces that you don’t get as a solo teller. When the Sultan tells the Servant to put the Rooster into the well, Sheila and Terri play aournd a bit as the Servant tries to grab the Rooster who zips just out of her reach a couple times. When Sheila finally gets the puppet, she whips it off Terri’s hand and throws it into the audience (which for now is the well...later they are the fire and the beehive). Then Terri recovers it and continues the story.... "the Little Rooster had a magic stomach…” This pattern goes on as the Rooster uses his magic stomach to swallow all of the water from the well; then empties the water to put out the fire; and then swallows all of the bees in the hive. Each segment has a mini-chase and a Rooster-toss. Oh, and when the water comes out to douse the fire, I squirt the audience with a water bottle. We talked about ways to do the next part, where the Sultan sits on the Rooster and the bees come out. Was there a way we could have the Rooster inside the pants? First we’d need to find some suitable baggy pants, and we just didn't have any handy. Maybe we could have worked it out, but we settled for Sultan just sitting upon Rooster, then getting stung. I’ve always enjoyed Rooster’s final trick: the audience thinks that once the Sultan gives up and the diamond button is returned, it’s all over, but Rooster uses his magic stomach to swallow up the Sultan’s treasure as well. For our K-2 Book Adventure theme of “Magic Tales and Tricks” we acted out one of my favorite picture books and also scanned some of the pictures to project on the screen. We just used simple hats and wands to be the three title characters. I was Wizard, Sheila was Fairy, and Terri was Magic Chicken. Brad didn’t do this program, but it was his idea to use PowerPoint with this story, and he’d done a slightly different version for Storytime in the past. We each demonstrated what we could do, one at a time, stepping forward and pushing the others out of the way when it was our turn. Then we’d cast our spell with a “Zip!” (Wizard), “Zap!” (Fairy), or “Zoop!” (Chicken), and the “magic” happens on the screen. 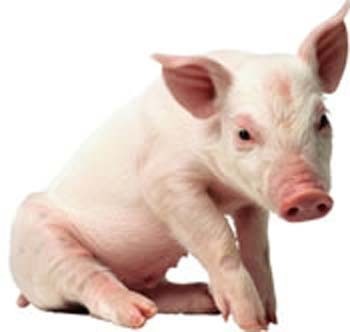 So when Wizard changes a pig into a bicycle, the pig shows on the screen, then it’s “Zip!” and the image is of flickering lightning, followed by a bicycle. Munsinger’s illustrations are great, but for this part we used photos of the objects. Sometimes it’s too hard to crop a single image out of a page when it’s not surrounded by white space. The book has Wizard kiss a pig to make the magic, but that didn’t make sense with the images on the screen; just pointing the wand worked better. After each character has done silly magic, they each create a monster. For these we did use Munsinger’s illustrations…they weren’t perfectly croppable, but close enough. I don’t like to distract from a story with a lot of PowerPoint effects, but I liked this one: When the monsters all look at the magicians, we use the “emphasis: grow” effect, so they all get larger at once. Then the three of us run around for a bit until we’re ready to try our magic. Wizard makes a cloud, but it doesn’t stop his monster. So that’s an image of the monster; then a cloud appears above him; then that “grow” effect again so he grows right over the cloud. Same thing for Chicken and her monster and rain. We didn’t have an image for Fairy’s thunder so we just had the kids all stomp. When the three friends finally all worked together, the cloud and rain images reappeared, plus Brad had added a cool (and loud) thunder sound effect. Using another PowerPoint effect, we showed all the monsters full size, then shrank them: that’s just copying five or six identical images, each one smaller than the next, stacked on top of each other. Then you use the “exit: dissolve” effect and click really fast, so the bigger sizes disappear one by one. Three tiny monsters are left and you have them each do a “motion path” that you draw in a bunch of squiggly, spirally lines, so it looks like they’re running crazily over the screen. This act-out/PowerPoint combo worked very well. As the three characters, we could play around and show enough personality so the focus was really on us. And the screen let us show the magic happening, but not to the point where it was distracting. 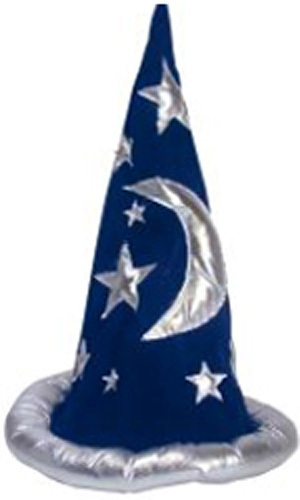 More posts on the “Magic Tales and Tricks” program will come soon….